The TAC Force Assisted Opening Tactical Folding Knife (TF-705 Series) features a black half-serrated blade, with a 4-1/2-inch closed length. Offering easy one-handed deployment, this spring assisted open folding knife locks securely into place with the use of its liner lock. 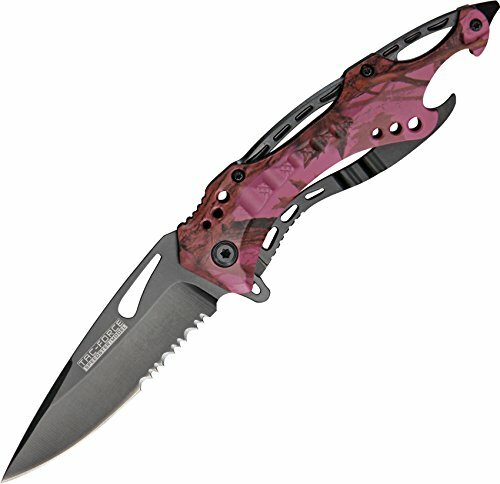 This knife features a 3-1/4-inch, 3mm thick stainless steel blade. The aluminum handle features a bottle opener and a glass breaker on the end, which can punch out the window of a car in an emergency. It also has a pocket clip for easy and safe carry. TAC Force designs spring assist folding knives that offer the rapid deployment desired by EMTs, Fire/Rescue, and first responders. They're available in a wide range of styles -- from hunting to tactical and collectibles to fantasy. If you have any questions about this product by TAC Force, contact us by completing and submitting the form below. If you are looking for a specif part number, please include it with your message.